Kul Tiras was founded by fearless explorers who sailed uncharted waters in search of adventure. 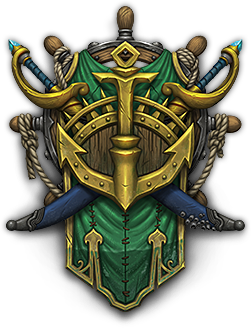 As a key member of the Alliance of Lordaeron, the Kul Tiran navy dominated the seas of Azeroth with its legendary fleet. But after years of turmoil and hardship, the kingdom grew isolated and vulnerable to dark influences. Thanks to the help of brave heroes, House Proudmoore has been restored and Kul Tiras is poised to fight alongside the valiant Alliance once more. Increase Versatility and regenerate a portion of damage taken. Hold your breath longer and swim faster. Haul off and punch an enemy, stunning and knocking them back. Increases skill in every tradeskill. Reduces Frost and Nature damage taken. In order to play as a Kul Tiran, you must first recruit this proud nation to your cause. After meeting the requirements below, head to Stormwind Embassy to begin your quest. Located just northwest of the Dwarven District in Stormwind, the embassy was established to welcome new supporters of the Alliance. Find Lord Admiral Jaina Proudmoore at the embassy to assist her in securing the allegiance of Kul Tiras. Though famous for its legendary navy, the Kul Tiran military prides itself on maintaining a formidable cavalry. Create a new Kul Tiran and reach level 110 to earn a distinctive Heritage Armor set—a lasting symbol of your dedication.